What I was up to last weekend. Wearing the pink and yellow striped tie and striped socks to match my pink and yellow bikes, everybody knows who Hank is even though they don't know me. On Sunday a set of parents told me their son said he "wanted to be like Hank" and wear some flashy socks. So now he's sporting Seattle Seahawks colors. Hey, as long as he's having fun. Saturday's racing was especially fun. I got through the single speed but the men's 60+ was great. Steve Rapp, Frank Benish, and I battled for third place for nearly the entire race. Steve and Frank are strong on the straightaways where they'd blast by me. I'm faster in the technical parts and I'd get right back in front again on a turn or at the barriers. Frank dropped back and Steve and I pushed each other hard for a couple of laps. On the last lap, Steve pressed forward on a straightaway and I just couldn't answer. I was out of gas. As we winded our way towards the end of the race I saw that Frank was catching up to me. Being tired and feeling pressured I made a huge mistake at the barriers and crashed. (It's right at the end of the first video.) That allowed Frank to gain a lot of ground and later pass me with about 100 yards to finish. Had I stayed upright I might have held him off for fourth place. But that's part of racing. For me it was fun just to have someone to race against. Allegro Cyclocross Day 1 from hank greer on Vimeo. Allegro Cyclocross Day 2 from hank greer on Vimeo. To my shock and surprise my name was called for third place in the men's single speed. I had finished fourth out of four on Saturday and fifth out of five on Sunday so how can that happen, right? It turned out that the combined scoring system they were using that weekend required you to race both days for your score to count. 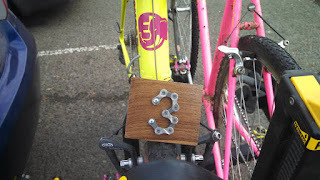 Only three of us raced both days so I scored this wooden belt buckle with a number "3" made out of bike chain links. Sweet! Truth be told, though, this is hardly a testament to my prowess on the single speed. Racing the single speed is hard and I'm not nearly as strong as the other racers. I'm in it for the fun of riding the course. I like to get two races in and doing the single speed allows me to have a two or three hour break between races.